Our mission to spread impactful stories and educational content will progress the impact investing movement, creating a bigger impact and a better world. This new blog series, “Expert Spotlights” will highlight one impact expert each week to and share their impact journeys and inspiring stories. 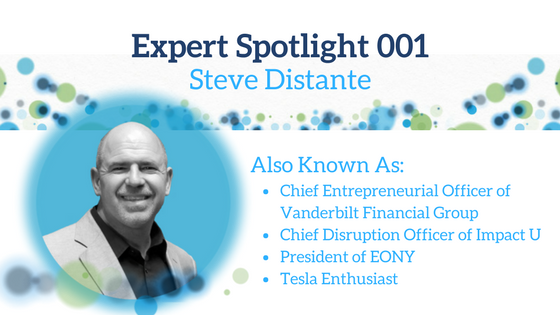 The first expert we would like to highlight is our very own founder, Steve Distante. Steve Distante is the Chief Entrepreneurial Officer of Vanderbilt Financial Group an independent broker dealer and RIA that has a unique focus on the ESG, sustainable, and impact investing space. Steve’s eyes were opened to the world of Impact Investing in 2013, when he had what we call an Impact ‘aha! moment’, read the story here. Steve describes Impact Investing is a “sea-change in investment attitudes” where investors will intend to make a traditional profit but also do good things for the world with their money through an ESG perspective. He believes that business “thrives when they have this sort of investment attitude” and encourages all entrepreneurs and investors to wake up to this change. Steve encourages the 150 financial advisors who are affiliated with Vanderbilt to adopt Impact Investing. He is a champion of Impact Investing, even incorporating it into his presidency of the Entrepreneurs Organization. Check out his latest EO podcast. To learn more about Steve Distante and to check out more of this content, check out his expert page here. Follow his impact journey on social media!